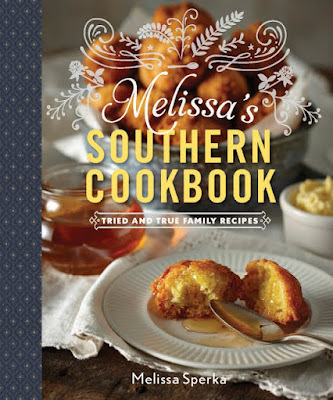 Melissa's Southern Cookbook by Melissa Sperka, a labor of love, paying homage to those who instilled in her a love for cooking and baking Southern-style. Wow is it hot y'all! I almost hate to say this because I know many of you are thrilled that summer is here, but it seems like it's been super hot here in the Deep South long enough now, that I'm actually looking forward to fall. In the meantime, I've got a nice cold dessert recipe from Melissa Sperka, straight from her newly published, debut cookbook Melissa's Southern Cookbook - Tried and True Family Recipes. It's her Granma's Famous Blueberry Icebox Pie, a true delight and perfect for these hot summer days. First, however, I'd like to introduce you to Melissa and tell you a little bit about her new cookbook! Melissa is the author of the popular blog, Melissa's Southern Style Kitchen and you've probably seen me share a recipe link here and there on my Facebook page from her blog. When I see a respected blogging colleague publish their first cookbook, it's always exciting for me too, because it's thrilling to see a member of our community get to showcase their blog and their recipes through print media. I know what a labor of love there is that goes into putting a cookbook together and Melissa's cookbook shows her love of cooking from page one. I was privileged to get a sneak peek, prepublication copy of her cookbook and I was filled with pride for her as I browsed through it. Page after page, my senses were awakened reading the recipes and passing over each mouthwatering photograph, most of which she shot herself. I knew immediately it would be the kind of cookbook that readers of Deep South Dish would enjoy and be proud to add to their collection. Like many southern food bloggers, Melissa who is from North Carolina, learned to cook from the traditions that began with her grandparents, who grew and harvested much of what they ate right on their Virginia farm, and also from her mother, who carried those mealtime traditions on further. In her cookbook, Melissa shares many of her personal family recipes that developed from that kitchen table education. Besides some of her favorite traditional southern recipes like Fried Green Tomatoes, Sausage Gravy and Biscuits, Mac and Cheese, Southern Skillet Cornbread, Chicken and Dumplings, Classic Buttermilk Biscuits, Homestyle Potato Salad and Fried Apples, you'll also find a collection of some of her own unique takes on favorite recipes, such as Puff Pastry Wrapped Smokies, Chocolate Chip Peanut Butter Banana Bread, French Onion Sour Cream Biscuits, Squash Hushpuppies, Green Chile Sweet Corn Casserole, Fiesta Taco Casserole, Pineapple Glazed Jamaican Jerk Pork Tenderloin, Philly Cheesesteak Pasta Bake and Chocolate Chip Toffee Potato Chip Cookies, just to name a few. It's a beautiful collection from an authentic soul, and I am so proud to share this find with the readers of Deep South Dish. You'll find Melissa's cookbook everywhere books are sold, and online at places like Amazon and other online retailers. This icebox pie is my Granma Minnie’s recipe. She was an old-school cook who raised and fed 13 children without a single written recipe. I recall sitting with her one afternoon at her table as she verbally told me how to re-create this goodie and now I make it for my own family. 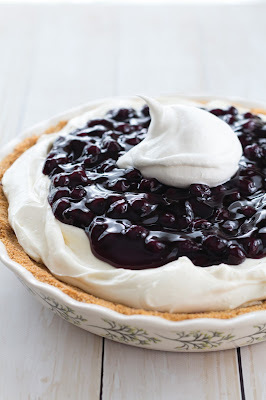 It boasts a creamy no-bake cheesecake filling and it’s topped with a brilliantly vibrant blueberry pie filling, making it a true feast for the eyes. There’s no need for words—just step aside and hand me a fork. To make the crust: Preheat the oven to 350°F. Lightly spray a 9-inch pie dish with cooking spray. Set aside. In a medium-size mixing bowl, toss together the graham cracker crumbs, butter, almonds, and granulated sugar. Press firmly onto the bottom and sides of the prepared pie dish. Bake for 12 to 15 minutes, or until set and beginning to brown. Remove from the oven and let cool completely. To make the filling: In a medium-size mixing bowl, use an electric mixer to mix the cream cheese, Dream Whip, cream, powdered sugar, and vanilla and almond extracts. Beat for 2 minutes, or until fluffy and smooth. Spread evenly into the cooled crust. Spread the blueberry pie filling on top. Refrigerate for at least 4 hours, preferably overnight, before serving. COOK’S NOTE: Dream Whip is a brand of dried whipped topping mix. One 2.6 ounce box contains two envelopes. Use both envelopes for this icebox pie. Disclosure: I received one free review copy of Melissa's Southern Cookbook, however all opinions stated here are voluntary and are my own.